Faes Farma, a Spanish pharmaceutical company founded in 1933, with a strong presence in Spain and Portugal and a growing international presence in many countries and exporting raw materials and finished pharmaceutical products to a lot of countries. To carry out its research, production and commercialization activities for pharmaceutical products, including its animal nutrition business, the company has a workforce of 1.174 people, covering its headquarters in Madrid, research center in Bilbao, Vitoria laboratory in Lisbon, Diafarm laboratory and animal nutrition companies Ingaso Farm, Tecnovit and Itf, and its subsidiaries and offices abroad. The result of Faes Farma´s commitment to pharmaceutical research has translated into the recent launch of our antihistaminic molecule Bilastine. Such molecule has been marketed in Spain since 2011 and as of today, has been launched in 107 countries worldwide. Faes Farma ended 2017with an increase in revenue of 274.6 million Euros. 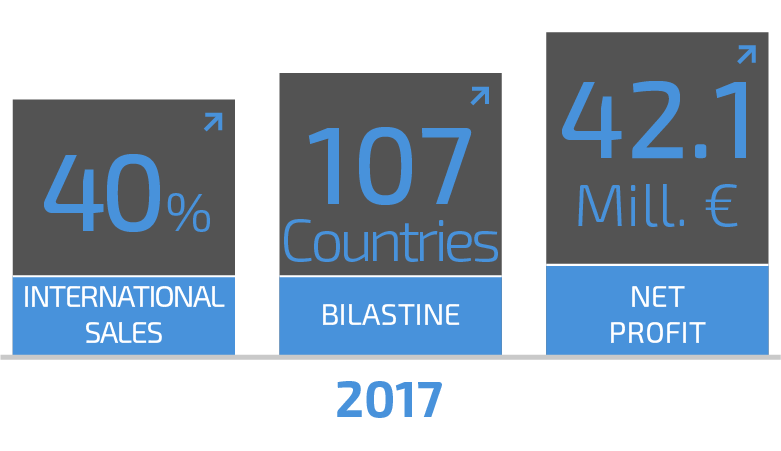 This positive performance has great value as it was achieved in static pharmaceutical markets in the Company´s as the main influence area, Spain, in 2017 inorganic acquisitions, in the international area and especially, on the positive evolution of income deriving from our in-house research molecule, Bilastine and its approval in Japan. Net profit has set a historical record reaching 42,1 million Euros, with a +15.1% growth over the same period in 2016.